This is a line of argument John often pursued with regard to genetics. I am somewhat sympathetic to a teleological reading of evolution, but I also know that I am wayyyy out of my depth in this subject. Most of my reading in genetics has been of very recent adaptations that only involve one gene, rather than complex adaptions of many genes working together. Thus, I feel a bit cautious about Conway's argument. Philosophically, I have no objections, but I don't have any idea whether the science actually supports his claims. Maybe you have sometimes suspected that the portrait of evolution as a random process is somewhat overstated. Maybe you have also wondered how scientist-popularizers, such as Stephen Jay Gould and Richard Dawkins, have been able to draw consistently agnostic metaphysical conclusions from a supposedly meaningless process. This book, by a professor of evolutionary palaeobiology at the University of Cambridge, calls the decade-long campaign by the neo-Darwinianists what it is: a polemic. In its place, he offers a model of evolution that is less like literary deconstruction and more like real science. The book is likely to restore many a science buff's faith in evolutionary biology. As for faith in other things, Morris is far from Creation Science, or even from Intelligent Design. However, he suggests that the natural world is the preface to the spiritual world that human beings inhabit, and not its antithesis. First, the complex is usually inherent in the simple. That is, structures that appear in advanced organisms are generally based on features that already appear in their simple ancestors. The existence of these “inherences,” or as yet unmanifested potentials, are some evidence that the whole history of evolution was already implied at the beginning. Second, the number of evolutionary endpoints is limited. Not every imaginable creature actually exists, or has ever existed in the past. In fact, only a small fraction of the imaginary “space” of conceivable living things has ever been occupied. That is even more true of biochemistry. The number of possible proteins is ridiculously huge, but only a tiny bubble in “protein space” has anything in it. In neither case is this economy of forms a matter of mere chance. Again and again, evolution “converges” on a relatively small set of possible solutions to the problems the world poses. Third, anything that can happen usually happens more than once. History counts for a great deal in evolution, but nevertheless, quite different lineages routinely arrive at the same “solution,” producing organisms with similar structures and behaviors. Stephen Jay Gould was simply wrong to say that, if we started evolutionary history over again, we would get a world completely different from our world. We know this because biological history does in fact often repeat itself, even in the laboratory. Fourth, evolution takes time. Not everything is possible in every historical period. Evoution is generally progressive over time. That is, it continues certain long-term trends. This is not to say that every lineage becomes more complex over time, much less that every lineage is trying to evolve into mankind. However, when novelty occurs, it prefers some directions to others. One might distill Morris's model into two principles. One is that there are certain “islands of stability” (like the “strange attractors” familiar from chaos theory) toward which evolution trends. The other is that evolution is as much about the development of “biological properties,” such as sight, endothermy, or body size, as about the development of lineages. The lineages come and go. The biological properties are strangely persistent. The breadth of Morris's argument is truly universal (in a moment, we'll get to his discussion of the place of Earth in the cosmos). His treatment of “convergences” in the biochemistry of unrelated creatures is perhaps a bit dense. However, one point that stands out is that the origin of life really does present intractable problems for mere natural selection. There are many possible codes that DNA could use to make proteins; the actual number has 18 zeroes in it. Most of these codes probably wouldn't work; those that would, still an immense number, are more or less efficient. The code that DNA actually uses may well be the optimum code; certainly it's one of just a handful of the best. Pure chance could not have sorted through that huge set of possibilities even in the known age of the universe. However, life arose no later than 200-million years after the crust of the Earth formed; it may have arisen in as little as 10-million years. Obviously, the lottery was rigged in some way to produce life, and to produce it quickly. The question is all the more exasperating because several decades of experiment have proven that no “one-pot” reaction will make life from primordial soup, or even advance the climb toward complexity. Morris treats us to a fair sample of the many times nature has repeated itself. Indeed, some biologists question whether there are any biological properties that are not convergent. Inevitably, the multiple times that the eye has evolved are not neglected, including a long discussion of the relative merits of the camera eye (which humans and squids have, for instance), and the compound eye, which gives insects that disconcerting steely look. The eye provides just one of many proofs that the expression “you can't get there from here” has little application to evolution. Some spiders and shrimp, for instance, originally opted for compound eyes, but then evolved camera eyes when the need arose. Similarly, some sharks have developed endothermy (internal control of body temperature). For that matter, even the great divide in the vegetable world, between flowering and non-flowering plants, is a narrower gulf than we supposed. The true flower seems to have evolved just once and then diversified. However, there is a kind of conifer, the Gnetales, which has devolved what in effect is a flower, down to the reinvention of the flower's trick of double pollination. Nature, we see, is no respecter of patent rights. Some convergences are trivial. It is not, for instance, very interesting that sea horses have heads that look a little like the heads of horses. In contrast, it is very significant that the marsupial wolves of Tasmania, and the big hunting cats of everywhere else, developed saber-teeth that function in a very similar way. Morris is at pains to show that not just anatomy, but also behavior, evolves convergently. We hear a great deal about “eusociality,” which is possessed by those creatures that live in communities where just one or a small number of individuals reproduce, and the rest are divided among castes of workers and warriors. Ants have developed eusociality several times, along with genuine agriculture. So, of course, have bees. It was only relatively recently, though, that biologists have realized that some mammals are eusocial. The prime example is the mole rat, which is completely horrible and lives in Africa. Properties of life that are more elusive than behavior may also be convergent. On the basis of some cross-species neurological comparisons, Morris suggests that many species share the “qualia,” the experience of sensation as distinct from the knowledge of facts. For instance, it seems that birds as well as humans experience sound “categorically.” That is, both the avian and human nervous systems break up continuous physical events into discrete packets of experience. Stretching a bit, Morris even argues that the consciousness of species that possess weird senses may not be so different from our own. Some fish that enjoy electrical sensitivity, for instance, have brains that treat it in much the way that other animals treat hearing. It is hard to say what the echolocation of bats may correspond to in our experience, but it would be premature to say it corresponds to nothing. Amidst all these convergences, we are still left with the apparent uniqueness of man. Even biologists who grudgingly concede that terrestrial megafauna were likely to have evolved also say that nothing like us was at all probable. Echoing Schopenhauer, they say that the big human brain is a fluke, and that human intelligence is not the result of any adaptation. To this Morris replies that mankind's big-brained mentality, with its heavy use of vocality and its high social intelligence, is unique in degree rather than kind. Dolphins, for instance, have the second largest brains on the planet, relative to the size of their nervous systems. Like man, they seem to have acquired that brain in a geological instant, in response to environmental stress. They don't seem to actually talk, but they use sound to organize themselves in a way comparable to that of human hunting groups. They even use tools, after a fashion, in that they put coverings on their noses when they root about on the ocean floor. What can be said of dolphins can also be said to a lesser degree of the elephant, that other uncannily intelligent animal. Because of their anatomies, neither dolphins nor elephants were in a position make extensive use of tools. However, they do illustrate that big brains are another point of convergence. Morris argues that more than one primate was ready to make the leap to intelligence about the time that man's ancestors did. He even nominates a bipedal ape as another candidate: oreopithecus, which lived seven million years ago on some islands that later became Tuscany. It might have beaten the human line to intelligence, had the sea level not fallen and exposed the creature to predators from the mainland. The actual pre-human line in Africa might have perished, but Morris says that some other species would have played the same role sooner rather than later. (He nominates another alternative, the capuchin monkeys of South America, despite their character flaws.) The lineage of homo sapiens was in no way favored. The biological property of “humanness” was favored. Some creature would have embodied it eventually. You might think that, having demonstrated that something similar to man was very likely to evolve on Earth, Morris would go on to propose that the stars are full of bipedal, camera-eyed, big-brained intelligences almost exactly like us. In fact, he can't quite drop the notion. He makes playful references to the strangely familiar conditions that would obtain on an Earth-like planet that he calls Threga IX. (Morris makes many playful asides, by the way: there is something to be said for any popular-science book that quotes Chesterton and repeatedly alludes to Tolkien.) He seems to be of the opinion that, if there are any other planets like Earth, they would indeed develop in much the way Earth did. The problem is that he entertains doubts about whether there are other such planets. It is possible that mankind is both inevitable and unique. It is interesting to compare his arguments with those that John Barrow and Frank Tipler made in “The Anthropic Cosmological Principle.” They, too, decided that Earth was more or less unique: but not for cosmological reasons, which they knew something about. Rather, they deferred to what they took to be the consensus among evolutionary biologists, which was that the appearance of intelligent life was so improbable that it could not be expect it to happen twice. Morris, who is an evolutionary biologist, simply reverses the deference. In Morris's defense, we may note that there is more information than there was in 1986, when Barrow and Tipler published their book. Dozens of planetary systems have been discovered since then, few if any like the solar system. On the other hand, Morris seems unduly impressed with studies suggesting that Earth's disproportionately large moon was necessary for the development of a stable biosphere. Without the slowing effect of the tides, it is said, Earth would rotate much more quickly, which we know would create routinely catastrophic weather. To that, one might respond that Mars and Venus rotate more slowly than Earth, Venus dramatically so, and neither has a large moon. Clearly, there are other factors. Far more interesting is the suggestion that there might be a very narrow window in galactic history during which biospheres could form. Earlier in its history, the galaxy may have been speckled with gamma-ray events, resulting from the collision of neutron stars. These could have sterilized large regions of space. Meanwhile, in each generation of stars, the level of metalicity increases. In other words, there is more detritus of heavy elements that is dispersed by the explosion and outgassing of older stars. Those strange solar systems we have been finding, with their superjovian planets just a few million miles from their suns, are younger systems with high metalicity. Earth's sun, in contrast, formed about 1.8-billion years later than other stars that typically have the same composition. Thus, the prime time for the development of Earth-like solar systems might have coincided with a dangerous radiation environment. This is all very speculative, but it cannot be dismissed. The final section of the book is called “Towards a theology of evolution.” It is short on actual theology. The author points out that he has not tried to make an Argument from Design. This is just as well, since an earlier generation of science-minded agnostics routinely used the supposed teleology in evolutionary history as an argument that God was an unnecessary hypothesis. He does suggest, though, that the actual content of science can co-exist very easily with a theistic worldview. The mind of the West could put back together the unity of intellect that the modern era tore asunder. To judge from “Life's Solution,” Morris is not a voice crying in the wilderness. Though his choice of sources is necessarily selective, Morris's wide-ranging survey shows that the biological sciences are full of people who know that evolution is not random or directionless. Nonetheless, he fights shy of discussing the ideas of people who have attempted the philosophical synthesis he calls for. One could understand him not bringing up Teilhard de Chardin, whose teleological model of evolution comes with more metaphysical baggage than Morris might want to deal with. But what about Robert Wright, whose book “Nonzero” argues that even mechanistic Darwinism implies a world that favors the evolution of intelligence? And then there was Kenneth Boulding, whose model of evolution as a growing pyramid of niches is not so different from Morris's suggestion that evolution reaches out to islands of stability. Such criticisms are churlish, however. 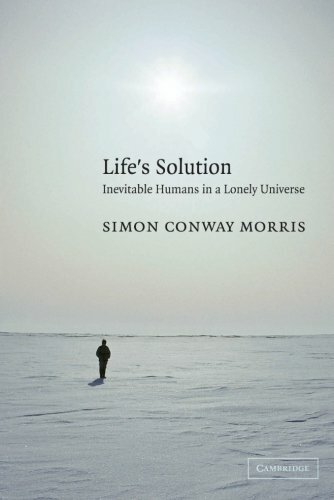 “Life's Solution” goes as far toward explaining The Meaning of Life as can be expected of any one book. This is a story that will have many sequels.